A Biographical Sketch of F.R.H. This was F.R.H.’s card designed by her Irish friend Mary Fay. In her final illness, Frances asked her sister Maria, “Fetch me Mary Fay’s card, ‘Jesus Christ the same yesterday, to-day, and forever,’ and bring a nail. I can see those nice large letters, and put it quite straight under Helga’s [von Cramm’s painting of] ‘Glacier.’ ” Maria wrote the comments at the top and the right end: F.R.H.’s life motto! The original designed & painted by Mary Fay, F.R.H.’s Irish friend. Next is a biographical sketch of F.R.H. written by Sherry Goodwin a few years ago. Frances was born in 1836 into a godly family; both of her parents knew and loved the Lord Jesus Christ, and she grew up hearing the Word of God and reading the Bible. Her father, William Henry, was a minister and the foremost church musician and composer of sacred music in England in his generation. Frances lived near the River Severn—a beautiful, magisterial river in England—when she penned the words to the much-loved hymn, “Like a River Glorious.” Out of her heart flowed a river of love, faith, and obedience to Christ, her King. Her well-known work, Kept for the Master’s Use, has remained in print, and she is frequently quoted in devotional works today. An edition of The Complete Works of Frances Ridley Havergal, never done until now, is being prepared for publication. There is a rich storehouse of gems and jewels in her works for readers then and now. Though she died at 42 and a half, Frances is best remembered as “the consecration poet”, her life being consecrated to her King, the Lord Jesus Christ. He made her heart His throne. It may be an encouragement to some of you to know that Miss Havergal did not begin her spiritual life on the gilded mountaintop of unbroken peace. She had many inner conflicts in the early years. Frances was the youngest of six children. Miriam, Maria, and Ellen were 19, 15, and 13 when she was born, and her brothers Henry and Frank were 16 and 7. Her mother had been called “the lovely Jane Head.” Her father, William Henry, the Anglican Church in Astley, an area of Worcestershire County, England. Her father called her “little quicksilver.” She had a sunny disposition and inherited her father’s love of music. She could read at the age of three and was very bright. pleasant leaf in God’s great lesson book . . .
God was revealing Himself to her by the creation. It was during this time Frances developed a deep and enduring love for nature and the outdoors, which stayed with her all of her life. Next came the conscience. The first conviction of sin for Frances was at the age of six, when she heard a sermon on the terrors of hell and judgment day. She thought about it day and night. She finally approached the Curate, the assistant pastor of the church, about the matter, but he didn’t take her seriously. He told her to “be a good child and pray.” So, she did not open her heart to anyone else about the matter for the next five years, although she was under deep conviction for being a naughty child and had concern for her soul most of the time. During that time, she climbed trees and could hardly sit still, except when reading and writing verse. Her first hymn was written at age seven. Later, she was sent to a boarding school in London where she was put under the tutelage of two godly women. Finally, at the age of 14, in true faith, she opened her heart to Christ. It was sweet, kind Miss Cooke, who was later to become her step-mother, that helped her to see she could trust Christ at once! Her whole life was changed. She had assurance that she would never be alone again and she had the Hope of Heaven. As a girl, Frances started the Flannel Petticoat Society for the clothing of poor children, and throughout her life she was truly concerned with the temporal needs of others as well as their eternal well-being. She knew that the real need of people is to hear about Christ, not just as an historical figure, but to be guided into a living and vital relationship, not just religion, but knowing Jesus as personal Saviour. She had come to faith in Christ, and she wanted others to know Him as well. Frances wrote the hymn, “Lord, speak to me that I may speak.” She worked in the harvest, pointing souls to Christ. In Sunday School, on train trips, in mission evangelistic services, at every opportunity, she told others of Christ’s love and their need of salvation in Him. All the things she did and said were true ministry from God because of her full surrender to Him. “There must be full surrender before there can be full blessedness,” Frances said. By the time she was 22, Frances could quote the whole of the Gospels, the Epistles, Revelation, Psalms and Isaiah by heart; yet she felt she was only a little child in the faith. Her entire life was characterized by simple faith and spiritual saintliness. While she was in Germany, she once viewed a painting of Christ wearing His crown of thorns, in the study of a German divine. Under the painting were the words: “This have I done for thee; what hast thou done for Me?” Frances was deeply moved, and wrote the words to the hymn, “I gave My life for thee.” Thinking her poem was not good enough, she threw it into a fireplace, and it rolled out of the fire unharmed. She kept it, and later showed it to her father, who encouraged her to use it and wrote the first music for it. I gave My life for thee, Galatians 2:20. My precious blood I shed, 1 Peter 1:19. That thou might’st ransomed be, Ephesians 1:7. And quickened from the dead. Ephesians 2:1. I gave My life for thee; Titus 2:14. What hast thou given for Me? John 21:15 –17. I spent long years for thee 1 Timothy 1:15. In weariness and woe, Isaiah 53:3. That an eternity John 17:24. Of joy thou mightest know. John 16:22. I spent long years for thee; John 1:10,11. Hast thou spent one for Me? 1 Peter 4:2. My Father’s home of light, John 17:5. My rainbow-circled throne, Revelation 4:3. I left, for earthly night, Philippians 2:7. For wanderings sad and lone. Matthew 8:20. I left it all for thee; 2 Corinthians 8:9. Hast thou left aught for Me? Luke 10:29. I suffered much for thee, Isaiah 53:5. More than thy tongue may tell, Matthew 26:39. Of bitterest agony, Luke 22:44. To rescue thee from hell. Romans 5:9. I suffered much for thee; 1 Peter 2:21 –24. What canst thou bear for Me? Romans 8:17,18. And I have brought to thee, John 4:10,14. Down from My home above, John 3:13. Salvation full and free, Revelation 21:6. My pardon and My love. Acts 5:31. Great gifts I brought to thee; Psalm 68:18. What hast thou brought to Me? Romans 12:1. Oh, let thy life be given, Romans 6:13. Thy years for Him be spent, 2 Corinthians 5:15. World-fetters all be riven, Philippians 3:8. And joy with suffering blent; 1 Peter 4:13 –16. I gave Myself for thee: Ephesians 5:2. Give thou thyself to Me! Proverbs 23:26. Frances was also a prodigious letter-writer. While vacationing in Switzerland, she wrote letters home that were posthumously published by her sister Miriam as Swiss Letters and Alpine Poems. They were written rapidly, beautifully and humorously. She found that the majesty of the mountains and nature drew out a deeper appreciation for the power and the glory of the Creator. She loved the outdoors and enjoyed all the seasons given by God as His special gifts. Frances felt tremendous physical benefits from walking and climbing in the pure air, enjoying the brisk, cool air. She used the highest advantages available to her physically, along with the noblest aims toward the benefits she wanted spiritually. This was accomplished by regular Bible reading, Bible study and prayer. This was her daily food. She kept her focus on her King, and this propelled her toward every kind of excellence available to her. Frances loved and valued all people because they were created in the image of God. She often spent vacations meeting and serving new acquaintances, including children as well as adults. She took opportunity to visit the sick, and shared food and encouraging words even with strangers. She was never too busy to speak to others and showed interest in their lives as well. She was industrious and very loyal. Although musically gifted and trained as a pianist and singer, Frances declined and avoided worldly fame. She determined her life’s mission was to sing and work only for Jesus. She began to publish her writings. The Ministry of Song (1869) was the first of many published works. She wrote poems, hymns and children’s works, as well as the set of five “Royal” books entitled My King, Royal Commandments, Royal Bounty, The Royal Invitation and Loyal Responses. She also wrote tracts, leaflets and small gift cards. Various articles and essays by her were published in periodicals. Her books, hymns and poems were widely known on both sides of the Atlantic, and many readers were deeply blessed by her works. 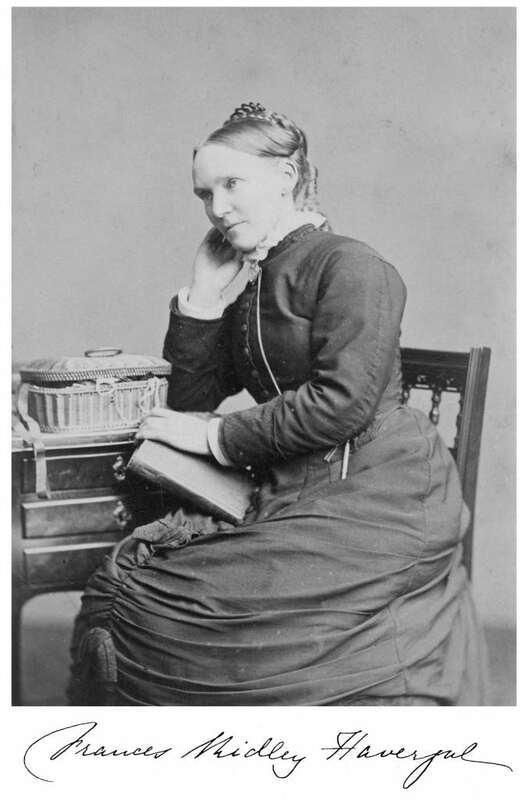 This is the most famous photograph of Frances Ridley Havergal, one of eight of her taken by the prestigious portrait photographers Elliott and Fry in London on February 1, 1879. In a letter dated February 7, 1879, F.R.H. wrote this: “I have been photographed ! Mr. Elliott himself came for me, Saturday, and they tried eight times, and hope one will do! Elliott and Fry both superintended in person; such a fuss! And I forgot to put on tidy frill and cuffs!” This would have been Saturday, February 1, 1879, only seven weeks after her forty-second birthday and four months before her unexpected early death on June 3. No one thought that she would die so young. She glowed Jesus Christ and His truth.